Murdoch Nisbet was a Scotsman who lived in Hardhill in the parish of Loudon and shire of Ayr. Before 1500 he turned against “Popery” and associated himself with the Lollards who were the followers of John Wycliffe. During the reign of James V of Scotland he fled Scotland because of persecution by the Papists. When he returned he went into hiding in a “vault at the bottom of his house” where he remained until the death of King James V.
Nisbet took Purvey’s revision of Wycliffe’s earlier New Testament and altered the grammar and vocabulary to make it easily readable to his countrymen. The original manuscript was made by Nisbet but it remained hidden in his family until the end of the 19th century when it was acquired by Lord Amherst of Hackney. 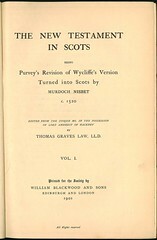 He allowed the Scottish Text Society to edit the manuscript for publication. In spite of the fact that this version likely predates Tyndale’s translation of the New Testament it had no impact on the history of the Bible in the British Isles since it remained a single manuscript hidden from public view. This publication was edited by Thomas Graves Law and Dr. Joseph Hall. Dr. Hall took over the editing after Dr. Law became ill and completed the project after Dr. Law's death. Click here For sample verses from the translation by Murdoch Nisbet. 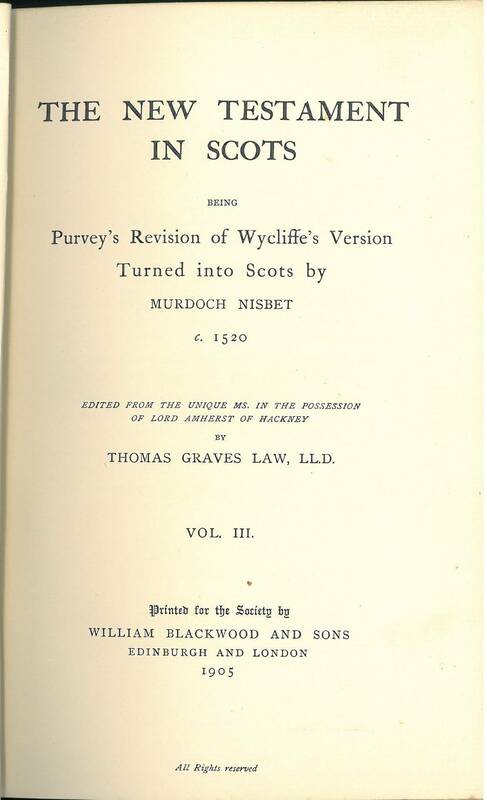 Title: The New Testament in Scots being Purvey's Revision of Wycliffe's Version Turned into Scots by Murdoch Nisbet c. 1520 edited from the unique ms. in the possession of the Lord Amherst of Hackney by Thomas Graves Law, LL.D. Vol I.
References: Herbert 2523; Chamberlin p. 566-1, Tulloch p. 3-10, Taliaferro-EELBV 7005. 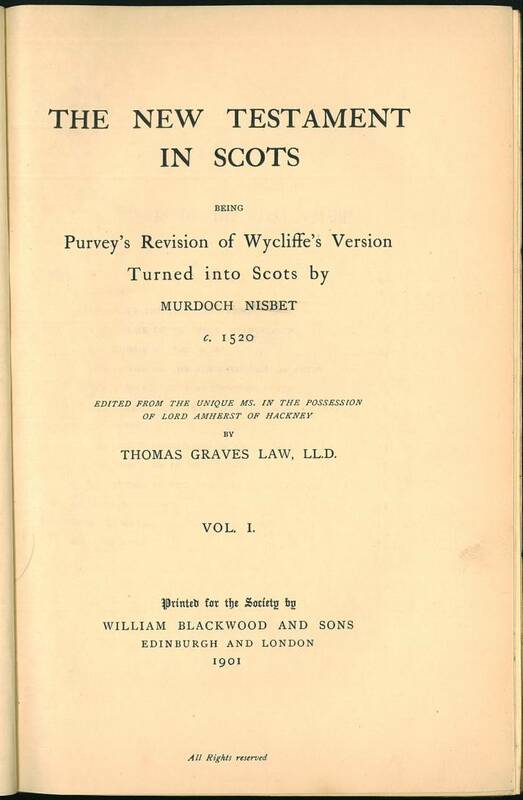 Title: The New Testament in Scots being Purvey's Revision of Wycliffe's Version Turned into Scots by Murdoch Nisbet c. 1520 edited from the unique ms. in the possession of the Lord Amherst of Hackney by Thomas Graves Law, LL.D. Vol II. 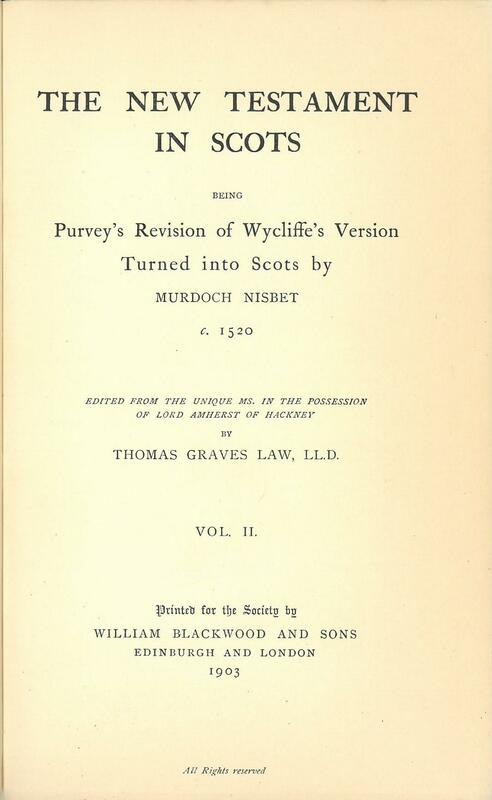 Title: The New Testament in Scots being Purvey's Revision of Wycliffe's Version Turned into Scots by Murdoch Nisbet c. 1520 edited from the unique ms. in the possession of the Lord Amherst of Hackney by Thomas Graves Law, LL.D. Vol III.